Agree with Lezford....it's a problem with most pubs in Blackheath, better off in O'Neils. Next to the station. London Pride cost £4.25 for a pint, but was dcent enough quality. Also had Doom Bar and HopStuff Session on draft. Right by station so handy for popping in if getting on/off a train. Busy, some lone commuters, but largely small groups of people in their 20s. Had to wait a minute to be servced, but they did have a sensible number of staff on. Anymore and they would have been colliding with each other/fighting over beer taps. It seems like I’m the only person that has reviewed the Railway in the last 18 months, so here we go again after another recent visit. Our last pub on a Wednesday night, 2 of us arrived at 10.55pm for one last drink. It was pretty busy still. 5 ales on, I had a pint of the Hopback breweries Winter Lightening @ 5.5%. Even though it was busy getting a space to stand wasn’t a problem. The bell was promptly rung at 11.15pm and then within 10 minutes everyone was thrown out, pretty surprised as I thought the Railway was open later. Still a decent pub in my opionon though my pal who lives in Blackheath hates the Railway with a passion…he has no idea ! After the Princess of Wales I moved onto the Railway to meet my pal. It’s been almost a year since I visited the Railway & it’s always been a favourite of mine in Blackheath. 5 hand pumps offering 4 ales and 1 real cider. I had a pint of My Generation Beer Co My Generation @ 4.2%, a new beer for me which was very well kept. Busy just after 7pm with a good crowd, good quick and attentive service. I do like the Railway. It’s been a few years since I’ve drank in Blackheath so I thought I would change that and have a 3 pub session one night last week. 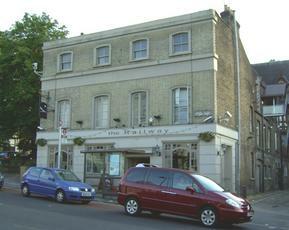 First pub of the night was the rather convenient Railway, located as you would assume right next to Blackheath railway station. This pub was made over around 10 years back from a normal fairly nondescript local to a Gastro-type pub. I used this pub many times over the years and at one time I was a regular. Anyway back to the present day, 4 pumps on the bar offering a range of beers, I had a very decent pint from Great Heck brewery while my companion had a pint of Meantime’s Pale Ale. I know Blackheath is not cheap but I was still surprised that for 2 pints I only received change of 80p from £10.00. It was just after 6.30pm and the place was half full, a few people in the garden enjoying the good weather. Fine and decent enough pub my only gripe being against parents that allowed a rather annoying child run wild with her doll & push chair…in and out, slamming the door as she went….it’s a pub not a blinking nursery!